liebe frau gesangsverein release their second single called �hier sein ist so schwer� (engl. : being here is so hard). the song beautifully depicts the desperation of being stuck. listening to this track, however, feels like the contrary: it is easy and almost soothing. the song combines tricky guitars and well placed vocals. the female singer ricarda giefer convinces once more with her brilliant lyrics and vocals. �hier sein ist so schwer� is taken from the debut album "nackt" (release: february, 23rd) which was recorded and produced by kurt ebelhaeuser (tonstudio 45, koblenz). 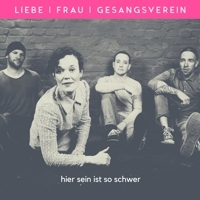 liebe frau gesangsverein is brilliant lyrics plus a mixture of strong guitar rock and a huge amount of punky elements.